During the last decade, Southeast Asian countries have been very successful in reducing the burden of malaria. However, malaria remains endemic in these countries, especially in remote and forested areas. The Leucosphyrus group of the genus Anopheles harbors the most important malaria vectors in forested areas of Southeast Asia. In Vietnam, previous molecular studies have resulted in the identification of only Anopheles dirus sensu stricto (previously known as An. dirus species A) among the Leucosphyrus group members. However, Vietnamese entomologists have recognized that mosquitoes belonging to the Leucosphyrus group in northern Vietnam exhibit morphological characteristics similar to those of Anopheles takasagoensis, which has been reported only from Taiwan. Here, we aimed to confirm the genetic and morphological identities of the members of the Leucosphyrus group in Vietnam. In the molecular phylogenetic trees reconstructed using partial COI and ND6 mitochondrial gene sequences, samples collected from southern and central Vietnam clustered together with GenBank sequences of An. dirus that were obtained from Thailand. However, samples from northern Vietnam formed a distinct clade separated from both An. dirus and An. takasagoensis by other valid species. The results suggest the existence of a cryptic species in northern Vietnam that is morphologically similar to, but phylogenetically distant from both An. dirus and An. takasagoensis. We have tentatively designated this possible cryptic species as Anopheles aff. takasagoensis for convenience, until a valid name is assigned. However, it is difficult to distinguish the species solely on the basis of morphological characteristics. Further studies on such as karyotypes and polytene chromosome banding patterns are necessary to confirm whether An. aff. takasagoensis is a valid species. Moreover, studies on (1) the geographic distribution, which is potentially spreading along the Vietnam, China, Laos, and Myanmar borders; (2) morphological and ecological characteristics; and (3) vectorial capacity of this newly identified cryptic species of An. dirus, which is one of the most important malaria vectors in the mainland of Southeast Asia, are necessary for planning efficient malaria vector control programs in this region. During the last decade, mainland Southeast Asian countries (i.e., Cambodia, Laos, Myanmar, Thailand, and Vietnam) have been very successful in reducing the burden of malaria . Their main strategies included prompt diagnosis and treatment and widespread coverage of vector control through insecticide-treated nets and indoor residual spraying . Malaria, however, has not yet completely disappeared and remains endemic in these countries. In remote and forested areas, the transmission rates are still high because of complex interactions between vectors, humans, and environmental factors , . Indoor residual spraying is ineffective against vectors that rest outdoors after feeding and vectors encountered outdoors , and bed nets are not easily adaptable to the lifestyle of forest workers . Environmental modifications that affect the distribution and abundance of vectors lead to changes in malaria transmission . Under these conditions, accurate species identification is essential in vector control. The Leucosphyrus group consists of 20 formally described species and 2 informal forms, and its members are distributed in the Oriental region [7–9]. The Dirus complex of the Leucosphyrus group includes the most important malaria vectors in forested areas in mainland Southeast Asia , . Anopheles dirus Peyton and Harrison, 1979 was first separated from Anopheles balabacensis Baisas, 1936 . Shortly thereafter, Anopheles takasagoensis Morishita, 1946 was elevated to species status from a synonym of An. balabacensis on the basis of cross-mating, cytogenetic, and morphological evidence . These findings implied that An. balabacensis, which until that time was considered to be the primary vector of human malaria in an area stretching from east India to the Philippines, is not a single species but a complex of three or more species . Mainly on the basis of cross-mating and cytogenetic experiments, subsequent intensive studies , [13–18] revealed that An. dirus also exists as a species complex that includes at least seven species: An. dirus sensu stricto (previously known as An. dirus species A); Anopheles cracens Sallum and Peyton, 2005 (species B); Anopheles scanloni Sallum and Peyton, 2005 (species C); Anopheles baimaii Sallum and Peyton, 2005 (species D); Anopheles elegans (James), 1903 (species E); Anopheles nemophilous Peyton and Ramalingam, 1988 (species F); and An. takasagoensis. At least two species in the Dirus complex, namely, An. dirus and An. baimaii, are recognized as major malaria vectors , . Anopheles balabacensis is now classified into the Leucosphyrus complex  with Anopheles leucosphyrus Dönitz, 1901, Anopheles latens Sallum and Peyton, 2005, and Anopheles introlatus Colless, 1957 [7–9] (see also Table 1). In-group and out-group data available from the International Nucleotide Sequence Database with internal classification of the Leucosphyrus group. Anopheles gambiae, An. quadrimaculatus A, An. albimanus, and An. aquasalis were assigned into an out-group, and the remaining species, as well as samples obtained in the present study, were assigned into an in-group. Among the members of the Leucosphyrus group, only An. dirus sensu strict has been found in Vietnam in previous molecular studies (reviewed in ). However, a member of the Leucosphyrus group in northern Vietnam had been identified as An. takasagoensis by some Vietnamese entomologists for the last 30 years [21–23]. Here, we conducted a molecular study on members of the Leucosphyrus group in Vietnam to confirm their genetic identity. Manguin et al. analyzed several specimens collected in 1970 from Ninh Bình Province, northern Vietnam, which exhibited adult and larval characteristics of both An. dirus and An. takasagoensis. They succeeded in sequencing mitochondrial Cytochrome c oxidase subunit I (COI) and ribosomal DNA internal transcribed spacer 2 (ITS2) of one of the specimens and identified it as An. dirus, whereas they have not yet deposited the sequence into the DDBJ/EMBL/GenBank database. They noted, "This casts doubt on the reported occurrence of An. takasagoensis...in northern Vietnam, but additional material needs to be collected and analysed before it will be known for certain whether the distribution of this species is limited to Taiwan." Here, we conducted a molecular study on members of the Leucosphyrus group in Vietnam to confirm their genetic identity. Sallum et al. 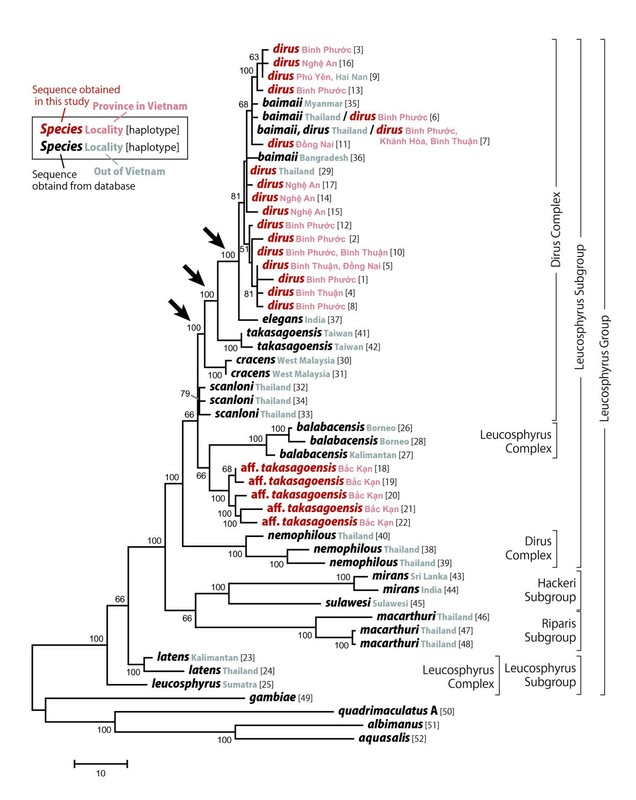 conducted a molecular phylogenetic study of the Leucosphyrus group. For comparison, we chose the same molecular markers: the partial sequences of COI (221 base pair (bp)) and NADH dehydrogenase subunit 6 (ND6: 349 bp) among mitochondrial genes. The advantage of using the same molecular markers is that Sallum et al. assessed 13 of 20 species of the Leucosphyrus group, including all the members of the Dirus complex. The disadvantages are that these markers cannot distinguish between An. dirus and An. baimaii and that the phylogenetic relationship within the group remains ambiguous, presumably because of the short length of the sequences analyzed (570 bp in total). However, to date, this is the only available molecular information covering the group but is still informative for distinguishing species (except An. dirus and An. baimaii). In 2008, we conducted field sampling in Bắc Kạn Province for one week and collected 11 larvae (but no adults) of the Leucosphyrus group, eight of which were analyzed in this study (Tables 2 and 3). These larvae were collected from partially or heavily shaded small pools near the starting points (seepage) of small streams in hilly areas covered with secondly evergreen forests. The water of the larval habitats was clear and not running. Other larval and female-adult samples were collected from various parts of Vietnam (Table 1). Collected larvae were reared to obtain adult specimens. Some samples were provided by collaborative entomologists, and a Hai Nan Island (China) strain of An. dirus maintained at the National Institute of Malariology, Parasitology and Entomology was also analyzed. The adult samples were tentatively identified as An. takasagoensis if they had more than one of the following three morphological characteristics (we followed the terminology reported in ,  as well as in ): a presector dark spot on vein R not or barely extending basally beyond the presector pale spot on the costa (basal extension typically occurs in An. dirus), a pale fringe spot between veins 1A and Cu2 present on at least one wing (absent in An. dirus), and an accessory sector pale spot on the subcosta (absent in An. dirus) (Table 1 and Figure 1). Comparison of wing-spot patterns (dorsal view). Typical An. takasagoensis (upper right), typical An. diru s (upper left, both adapted with permission from Sallum et al. ), An. dirus analyzed in this study (black border), and An. aff. takasagoensis (red border). Anopheles aff. takasagoensis exhibited the same spot patterns as typical An. takasagoensis: presector dark spot on vein R that does not extend or barely extends basally beyond the presector pale spot on the costa, a pale fringe spot between veins 1A and Cu2, and an accessory sector pale spot on the subcosta. Some samples from Nghệ An Province (PM01914, PM01804, PM01805, and PM01867) also exhibited spot patterns similar to those of An. takasagoensis, but they were identified as An. dirus by molecular analyses. The specimens had been stored dry at room temperature or below -20°C for up to 7 years prior to DNA extraction. Depending on the condition of each specimen, we used a single leg or a combination of a single leg and some other body parts (i.e., additional legs, a wing, or a head, but not female abdomens, the spermathecae of which might include sperm from mating). We extracted DNA using the REDExtract-N-Amp™ Tissue PCR Kit (Sigma-Aldrich) with a modification of the manufacturer's protocol for animal tissues. Extraction Solution and Tissue Preparation Solution were mixed in a 4:1 ratio. We added 20 μl of the mixture per leg and homogenized them in a microtube using the tip of a pipette. After 10 min of incubation at room temperature, the samples were incubated at 95°C for 3 min. We added 16 μl of Neutralization Solution B per 20 μl of the homogenized sample and mixed them by vortexing. The neutralized tissue extract was centrifuged at 10,000 g for 1 min, and the supernatant was added to a new microtube and stored at 4°C until used for PCR reactions. We selected molecular markers and primers according to Sallum et al. Amplification with the primers UEA9.2 (5'-cta aca ttt ttt cct caa cat ttt tta gg-3') and UEA10.2 (5'-tta tta gtt aat aay ggt art tct g-3') yielded a 221-bp product (excluding the primers), partial sequence of the COI gene. Amplification of the primers ND6.F2 (5'-ttg gwc gta awg gwc cat aaa a-3') and ND6.R3 (5'-car gaa tyt atg taa aaa cat ttt g-3') resulted in a product of 349 bp (excluding the primers), part of the ND6 gene. We modified the PCR protocol of Sallum et al. . For COI, each 20-μl PCR reaction contained 2 μl of 10×EX Taq buffer (TaKaRa, Japan), 0.2 μM of dNTP, 0.5 μM of UEA9.2 primer, 1.0 μM of UEA10.2 primer, 0.1 μl of EX Taq® Hot Start Version (TaKaRa), and 1.0 to 2.0 μl of DNA extract. The reaction mixture for ND6 was the same as that for COI, except that 1.0 μM each of ND6F.2 and ND6.R3 primer was added instead of UEA9.2 and UEA10.2. ASTEC PC320 and PC816 thermal cyclers were used. The thermal cycling profile for COI consisted of 5 cycles of 30 s at 94°C, 30 s at 37°C, and 30 s at 72°C, followed by 40 cycles of 30 s at 94°C, 30 s at 47°C, and 30 s at 72°C, with a final extension of 2 min at 72°C. The profile for ND6 consisted of 5 cycles of 30 s at 94°C, 30 s at 37°C, and 30 s at 72°C, followed by 45 cycles of 30 s at 94°C, 30 s at 49°C, and 30 s at 72°C, with a final extension of 2 min at 72°C. The PCR product was separated on a 2% agarose gel and visualized by ethidium bromide staining. Fragment sizes and product density were estimated by comparison with molecular weight standards. We purified the PCR products using ExoSAP-IT (GE Healthcare Japan). We diluted ExoSAP-IT 10 times with Milli-Q water, added 2 μl of the dilution to 5 μl of the PCR product, incubated the solution at 37°C for 30 min, and then inactivated enzymes by incubating at 80°C for 15 min. Sequence reactions were carried out on both strands of DNA using the primers listed above and the ABI BigDye® terminator Cycle Sequencing Kit v3.1 (Applied Biosystems). The reaction products were purified by ethanol precipitation and resolved in Hi-Di™ Formamide following the manufacturer's protocol, and the sequences were determined with an ABI PRISM 3730 Genetic Analyzer. Complimentary strands were combined into consensus sequences, and questionable base calls were corrected manually by comparison with the original waveform. When the correction of the questionable base call was difficult, the site was recorded as missing data. We concatenated the COI and ND6 sequences and identified 22 unique sequences, i.e., haplotypes (Tables 2 and 3). Specimens used in this study (to be continued). Nguyen D. M. et al. Vu Dinh Chu et al. Nguyen Van Chau et al. Takano T. K. et al. Vu Duc Chinh et al. Le Xuan Hoi et al. Hoang Van Tan et al. Specimens used in this study (continued). 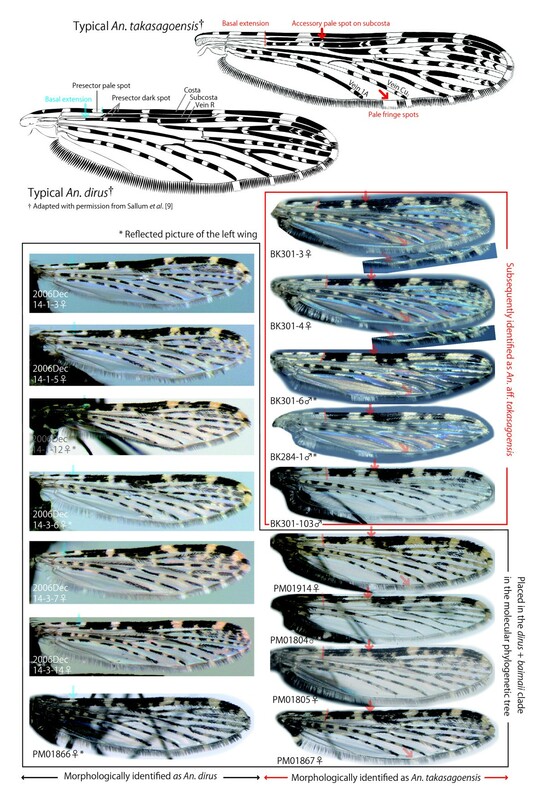 Not analyzed but wing spots are shown in Figure 2. Further, we obtained the GenBank sequences of members of the Leucosphyrus group (in-group, 37 samples) and those of four other Anopheles species (out-group, Table 1). Sallum et al. deposited the COI sequences that include the sequence of the UEA9.2 primer (29 bp) in GenBank and reconstructed phylogenetic trees on the basis of these sequences. We excluded the UEA9.2 primer sequence from our analysis. There were no insertions or deletions in these sequences; however, the sequences BK101, BK284-2, BK301-103 (Table 2), balabacensis _3, dirus _3, and baimaii _6 (Table 1) had 8-87 missing sites at the 3'- or 5'-end of either the COI or ND6 sequences (Additional files 1, 2 and 3). Finally, we obtained 52 unique sequences and assigned a haplotype to each of them (Tables 1, 2 and 3 and Additional files 1, 2 and 3). The neighbor-joining (NJ) and maximum parsimony (MP) methods were performed with the MEGA4 software . All codon positions were included, and all ambiguous sites were treated as missing data. The resultant trees were rooted using the out-group. In the NJ phylogenetic reconstruction, the evolutionary distances were computed using the Jukes-Cantor method. All sites containing missing data were eliminated only in pairwise sequence comparisons (pairwise deletion option). To assess the reliability of the NJ tree, the bootstrap test and the interior branch test were performed with 2,000 replicates. In the MP phylogenetic reconstruction, the most parsimonious trees were obtained using the close-neighbor-interchange algorithm at search level 3, in which the initial trees were obtained by random addition of sequences (10,000 replicates). There were 570 sites in the final dataset, of which 137 were parsimony informative. The consensus tree was generated from the 3517 most parsimonious trees. Branches corresponding to partitions reproduced in less than 50% of trees were collapsed. Branch lengths were calculated using the average pathway method and are expressed in units of the number of changes over the whole sequence. The percentages of parsimonious trees in which the associated taxa clustered together are shown next to the branches. By the morphological examination, all the samples collected from Bắc Kạn Province in northern Vietnam and four of five samples from Nghệ An Province in central Vietnam were tentatively identified as An. takasagoensis (Tables 2 and 3 and Figure 1). In the molecular phylogenetic reconstruction using the NJ method (Figure 2), haplotypes 18-22 of the Bắc Kạn samples formed a distinct clade with high bootstrap (91%) and interior branch test (97%) support; this clade was separated from haplotypes of both An. takasagoensis and An. dirus. This clade then clustered with haplotypes 26-28 of An. balabacensis, but the bootstrap and interior branch test support were lower, with values less than 50%. Other haplotypes obtained in the present study (haplotypes 1-17), including those of the Nghệ An samples, were clustered together with those of An. dirus from Thailand and An. baimaii from Thailand, Myanmar, and Bangladesh. The (An. dirus + An. baimaii) clade was subsequently clustered with An. elegans from India with moderate bootstrap support (75%) and high interior branch test support (95%) (indicated with an arrow in Figure 2). Subsequently, An. takasagoensis clustered with the (An. dirus + An. baimaii + An. elegans) clade, An. cracens clustered with the (An. dirus + An. baimaii + An. elegans + An. takasagoensis) clade, and An. scanloni clustered with the (An. dirus + An. baimaii + An. elegans + An. takasagoensis + An. cracens) clade with moderate to low bootstrap and interior branch test support (Figure 2). The Dirus complex members, An. balabacensis, and the Bắc Kạn samples formed a clade with high bootstrap (89%) and interior branch (98%) support. This clade next combined with the (An. leucosphyrus + An. latens) clade, and the resultant clade corresponded to the Leucosphyrus subgroup. The Leucosphyrus subgroup clade combined with the Hackeri subgroup clade (An. sulawesi + An. mirans), and further combined with the Riparis subgroup clade (An. macarthuri). The NJ topology was consistent with the traditional classification of the Leucosphyrus group , except that the Leucosphyrus complex were regarded as paraphyletic taxa (Figure 2). Neighbor-joining tree with traditional classification. The evolutionary distances were computed using the Jukes-Cantor method based on concatenated sequences of partial COI (221 bp) and ND6 (349 bp) mitochondrial genes. All positions containing missing data were eliminated only in pairwise sequence comparisons (Pairwise deletion option). The bootstrap test and the interior branch test were performed with 2,000 replicates, respectively, and each value equal to or above 50% is shown above (bootstrap value) and below (interior branch test support) the branches. In the MP tree (Figure 3), haplotypes 18-22 from the Bắc Kạn samples also formed a clade with 100% consensus; this clade was separated from the haplotypes of both An. takasagoensis and An. dirus. The Bắc Kạn haplotypes then clustered with haplotypes 26-28 of An. balabacensis with 66% consensus. Other haplotypes obtained in the present study (haplotypes 1-17), including those from the Nghệ An samples, were clustered together with those of An. dirus from Thailand and An. baimaii from Thailand, Myanmar, and Bangladesh with 81% consensus. Subsequently, the topology ((((An. dirus, An. baimaii) An. elegans) An. takasagoensis) A. cracens) was supported by 100% consensus (indicated by arrows in Figure 3). This clade clustered with An. scanloni and the (An. balabacensis + Bắc Kạn samples) clade with 66% consensus and further combined with the An. nemophilous clade with 100% consensus. This clade then combined with the ((An. sulawesi + An. mirans: the Hackeri subgroup) + An. mirans: the Riparis subgroup) clade with 100% consensus, whereas An. leucosphyrus and An. latens formed the most basal lineage and second most basal lineage, respectively, in the Leucosphyrus group (Figure 3). Thus, the MP topology was less consistent with the traditional classification of the Leucosphyrus group in that neither the Dirus complex nor the Leucosphyrus complex and the Leucosphyrus subgroup were regarded as monophyletic taxa. Maximum parsimony 50%-majority-rule consensus tree with traditional classification. The consensus tree was generated from the 3517 most parsimonious trees based on the concatenated sequences of partial COI (221 bp) and ND6 (349 bp) mitochondrial genes. Branches corresponding to partitions reproduced in less than 50% trees are condensed. The percentages of parsimonious trees in which the associated taxa clustered together are shown next to the branches. Branch lengths were calculated using the average pathway method and are expressed in units of the number of changes over the whole sequence (scale bar). Anopheles gambiae, An. quadrimaculatus A, An. albimanus, and An. aquasalis are assigned as out-group taxa. For the last 30 years, Vietnamese medical entomologists [21–23] have noted that mosquitoes belonging to the Leucosphyrus group collected from northern Vietnam exhibited wing-spot patterns that are different from those of An. dirus from southern Vietnam, but similar to those of An. takasagoensis, which has actually only been found in Taiwan. However, the spot pattern variations partially overlap between An. dirus and An. takasagoensis so that it is generally difficult to determine these species solely on the basis of morphological characteristics . This seems to be the very reason why foreign scientists recognized that among the Leucosphyrus group members, An. dirus is the only species that is distributed in Vietnam. In the present study, all the haplotypes of the mosquitoes from southern and central Vietnam clustered into the (An. dirus + An. baimaii) clade. Although partial sequences of COI and ND6 in mitochondrial DNA do not provide a clear distinction between An. dirus and An. baimaii, , it is reasonable to regard the samples from southern and central Vietnam as An. dirus after taking into consideration the well known distributions of An. dirus and An. baimaii,  (Molecular identification in Table 1). However, molecular phylogenetic analyses in this study could not resolve population structure of An. dirus in Vietnam. This is also the limitation of the molecular markers and beyond the scope of the study so that we refrain from discussing the population structures of An. dirus in Vietnam at present. The haplotypes of samples collected from Bắc Kạn Province in northern Vietnam were clearly separated from those of both An. dirus and An. takasagoensis in both the NJ and MP trees. In the NJ tree, the Bắc Kạn samples formed a distinct clade with 91% bootstrap and 97% interior branch test support, whereas the (An. dirus + An. baimaii) clade formed another clade with An. elegans with 75% bootstrap support and 95% interior branch test support (indicated by an arrow in Figure 2). In the MP tree, the Bắc Kạn samples again formed a distinct clade with 100% consensus, whereas the (An. dirus + An. baimaii) clade formed another clade with An. elegans with 100% consensus, and this clade subsequently formed other clades with An. takasagoensis and An. cracens with 100% consensuses, respectively (indicated by arrows in Figure 3). These results suggest that the Bắc Kạn samples are distinctly separated from An. dirus by at least three valid species--An. elegans, An. takasagoensis, and An. cracens--and from An. takasagoensis by at least one valid species--An. cracens. The clade consisting of Bắc Kạn samples formed another clade with An. balabacensis; however, the reliability of the branch was not high, with 66% consensus in the MP tree and less than 50% bootstrap and interior branch test support in the NJ tree. The overall morphological characteristics of the Bắc Kạn samples, however, were closest to or even indistinguishable from those of An. takasagoensis and An. dirus but were distinguishable from those of An. balabacensis and the other Leucosphyrus group members (Figure 1). Moreover, the distribution of An. balabacensis is known to be restricted to the area from the Philippines up to Indonesia. These results suggest that the mosquito samples obtained from Bắc Kạn Province belong to the Leucosphyrus group but not to An. dirus, An. takasagoensis, An. balabacensis, or any other species in the Leucosphyrus group; thus, these samples seem to represent a newly recognized cryptic species in the Leucosphyrus group. We tentatively designate the possible cryptic species as Anopheles aff. takasagoensis for convenience, until a valid name is assigned. In the NJ tree, the possible cryptic species formed a clade together with An. balabacensis and members of the Dirus complex with 89% bootstrap and 98% interior branch test support, whereas the other Leucosphyrus complex members, namely, An. leucosphyrus and An. latens, formed another clade beside the former clade. This topology seems to be consistent with the indications by Sallum et al. . They stated that morphological distinction between the Leucosphyrus and the Dirus complexes is problematic because some characters used to define the limits of each species complex are polymorphic. Generally, members of the Leucosphyrus complex can be easily distinguished from those of the Dirus complex by the presence of an accessory sector pale (ASP) wing spot on veins C, subcosta, and R and the absence of pale scales at the base of hind tarsomere 4 . However, An. balabacensis is polymorphic for these characters and thus can overlap with members of both the Dirus complex and Leucosphyrus complex . In the MP tree, the (An. aff. takasagoensis + An. balabacensis + members of the Dirus complex) clade was also supported by 100% consensus, whereas the topology within the clade was consistent with that observed in the case of the NJ tree only for the (((An. dirus, An. baimaii) An. elegans) An. takasagoensis) relationship. Moreover, An. leucosphyrus and An. latens were separated from the other members of the Leucosphyrus subgroup and formed the most basal lineage and second most basal lineage in the Leucosphyrus group, respectively. This might be partly because of the long-branch attraction, to which the MP method is more sensitive than the NJ method with a corrected distance model is. It is not possible to correct for multiple nucleotide substitutions at the same site in the MP method; this leads to systematic underestimation of the genetic distances. Hence, distant species will either be clustered together or drawn toward the root of the tree , . However, this basal positioning of An. leucosphyrus and An. latens was also reproduced by phylogenetic reconstruction using the maximum likelihood and Bayesian methods in our preliminary analyses (data not shown). This indicates the limitations of the present dataset: the length of the sequence data is limited, and it includes 13 of 20 species in the Leucosphyrus group whereas including all the species from various locality is desirable. Although the information is limited, we would like to propose following three hypotheses to be tested in the future studies. First, An. nemophilous should be removed from the Dirus complex. The remaining members of the Dirus complex are then characterized by morphological characteristics in that pale scales on anterior veins of wing, especially those on presector pale and sector pale spots of the costa, are white and contrasting with other yellowish to golden pale spots on remaining posterior veins  (but An. aff. takasagoensis has the same characteristics). Second, members of the newly hypothesized Dirus complex (An. dirus, An. cracens, An. scanloni, An. baimaii, An. elegans, and An. takasagoensis) and An. nemophilous, An. balabacensis and An. aff. takasagoensis further form a distinct taxonomical group that is equivalent to a subgroup. Third, An. leucosphyrus and An. latens belong to the most basal or even an outer group of the remaining members of the Leucosphyrus subgroup analyzed in this study. The cryptic species exhibited morphological characteristics distinguishable from those of typical An. dirus in southern Vietnam: the presector dark spot on vein R that does not extend or barely extends basally beyond the presector pale spot on the costa, a pale fringe spot present between veins 1A and Cu2, and an accessory sector pale spot on the subcosta on at least one wing. We must note, however, that these characteristics are still included within the intraspecific morphological variation of An. dirus. Samples from Nghệ An Province in central Vietnam exhibited the same morphological characteristics of the cryptic species, but their haplotypes were placed within the monophyletic clade consisting of An. dirus haplotypes. The samples collected from Ninh Bình Province in northern Vietnam and analyzed by Manguin et al. (, mentioned in Background), with morphological characteristics of both An. dirus and An. takasagoensis, might have been individuals of this An. dirus type. The geographical proximity of Ninh Bình and Nghệ An provinces supports this speculation. It is known that wing-spot patterns of Anopheles mosquitoes can vary according to temperature and day-length . The wing-spot patterns of An. dirus might also vary along with the longitude in Vietnam. According to the collection records based on identification using wing-spot patterns, populations of the hypothetical cryptic species have been shrinking after the 1970s, presumably because of deforestation in northern Vietnam (NDM, personal observation). Samples of the putative cryptic species have been sporadically collected from central and northern Vietnam. In 1970, 14 larvae were collected from a rice field surrounded by a forest in Cúc Phuong National Park in Ninh Bình Province. The resultant nine larval and five pupal exuviae and nine female-adult specimens are deposited in NIMPE, even though the each exuviae is mounted on a slide grass and the each adult specimens is encapsulated in a glass tube and is not available for genetic analyses. In 1973, less than 10 adult females were collected by human bate from Hòa An District, Cao Báng Province, which is located along the northern border with China (NDM, personal communication). In 2001, the putative cryptic species was collected from Yên Thành Commune, Quang Bình District, Hà Giang Province, which is also located along the northern border with China (Le Xuan Hoi, personal communication). Also in 2001, the putative cryptic species is collected from Chiêng Yên commune, Môc Châu District, Son La Province, which is located along northern-western border with Laos. Other samples are also collected from Trương Son commune, Luong Son District and Phúc San commune, Mai Châu District in Hòa Bình Province in northern Vietnam. Taking the information above and the results of molecular analyses in Manguin et al. and the present study into consideration, An. aff. takasagoensis seems to replace An. dirus in the north of Ninh Bình Province (about 20°N). However, it is unclear whether An. dirus and An. aff. takasagoensis are distributed sympatrically. Further confirmation using molecular markers is necessary. Bắc Kạn Province, from where An. aff. takasagoensis samples were collected in this study, is located near the border of Vietnam and China. Anopheles baimaii occurs in Yunnan Province in China along the borders of Laos and Myanmar . Walton et al. showed that the ITS2 sequence of the Chinese "species D" (An. dirus species D or An. baimaii) of Xu and Qu  is distinct from that of specimens collected in Thailand and suggested that the Chinese "species D" may represent an unrecognized species of the Dirus complex. We, however, failed to obtain consistent ITS2 sequences from our samples over the course of the present study. Confirmation of the genetic identities of An. aff. takasagoensis and the putative An. baimaii from the areas along the Vietnam, China, Laos, and Myanmar borders is also necessary. The larval habitat of An. aff. takasagoensis was similar to that of An. dirus in southern Vietnam as described in Methods. However, the population density of An. aff. takasagoensis was extremely low so that we obtained only 11 larvae during the field collection for one week with seven staff members, even though we targeted on only this species. Moreover, the existence of the samples were localized; we found the samples from only one commune among four communes investigated. In allozyme analyses of lactate dehydrogenase (LDH), glutamate-oxaloacetate transaminase (GOT), glucose phosphomutase (GPM), and glucose-6-phosphate dehydrogenase (G6PDH), other specimens of putative An. aff. takasagoensis also exhibited a different banding pattern from that of An. dirus in southern Vietnam (NTHN et al., unpublished data). In 2006, a 10 staff-member team of NIMPE were able to collect only five female adults in a buffalo hat over a one-month field-collection period in the same study area in Bắc Kạn (Le Xuan Hoi et al., personal communication). In 2007, Manh et al. collected two female adults of the putative cryptic species at the same buffalo hat. We succeeded to obtain partial COI (but not ND6) sequences of these two samples, and the haplotypes clustered with those of other An. aff. takasagoensis specimens analyzed in the present study (data not shown). These female adults seem to have been attracted by the buffalo. NDM, one of the co-authors of this study, failed in his attempt to feed an adult female with his blood in order to obtain progeny. This implies that the hypothetical cryptic species tends to be zoophilic, although in general, An. dirus is a highly anthropophilic species. This information reinforces our hypothesis that the mosquito population from northern Vietnam belongs to a cryptic species. Further investigations of such as karyotypes and polytene chromosome banding patterns are necessary to confirm whether An. aff. takasagoensis is a valid species. 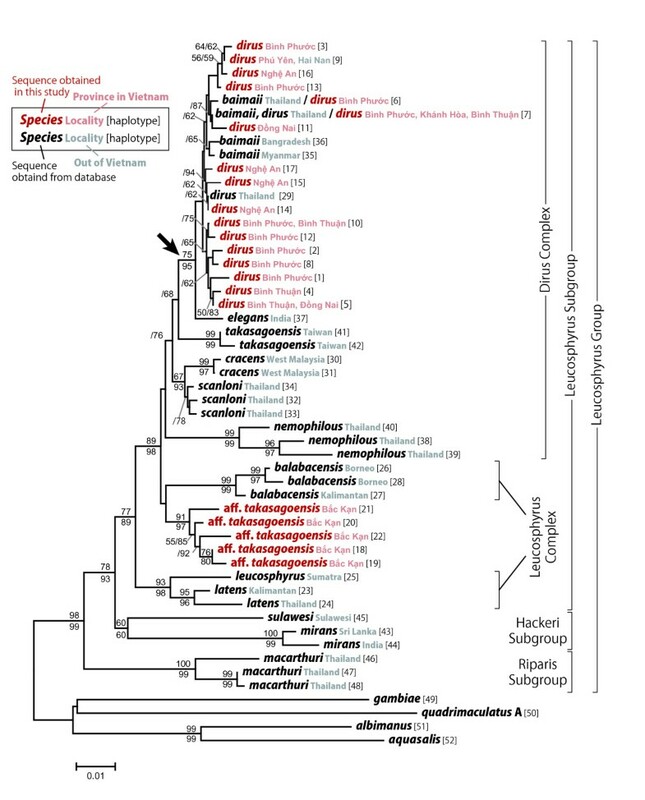 Morphological examination and molecular phylogenetic analyses of the members of the Leucosphyrus group in Vietnam suggested the existence of a cryptic species that is morphologically similar to, but genetically distant from both An. dirus and An. takasagoensis. We tentatively designated the species as Anopheles aff. takasagoensis. However, it was difficult to identify the species solely on the basis of morphological characteristics. Further studies on such as polytene chromosome banding patterns and karyotypes are necessary to confirm whether An. aff. takasagoensis is a valid species. Further studies on the (1) geographic distribution, which is potentially spreading along the Vietnam, China, Laos, and Myanmar borders; (2) morphological and ecological characteristics; and (3) vectorial capacity of this newly identified possible cryptic species of An. dirus, which is one of the most important malaria vectors in mainland Southeast Asia, are necessary for efficient malaria vector control in this region. We thank members of the Bắc Kạn Provincial Malaria Center, Commune Health Center, and the Department of Molecular Biology of NIMPE, and TSUZUKI Ataru for help in the field collection in Bắc Kạn Province, Vietnam; Ho Dinh TRUNG, Le Xuan HOI, Vu Dinh CHU, Vu Duc CHINH and other members of the Department of Entomology, NIMPE for providing Anopheles samples; SAWABE Kyoko and KOMAGATA Osamu for their advice on DNA extraction; and SIBATA Hiroki, and OKUDA Naoko for their help and guidance in DNA sequencing. This study was conducted as part of the Program of Founding Research Centers for Emerging and Reemerging Infectious Diseases of the Ministry of Education, Culture, Sports, Science and Technology of Japan. This study was also partly supported by the Vietnam Global Fund Malaria Control Project to NTHN; by "the Core University Program between Japan Society for the Promotion of Science and Vietnamese Academy of Science and Technology"; by the Global COE Program, Nagasaki University, Japan; and by a Grant-in-Aid for Scientific Research of Emerging and Reemerging Infectious Diseases from the Ministry of Health, Labor and Welfare of the Japanese Government (H18-Shinko-009). All the specimens of An. aff. takasagoensis are deposited in the Department of Molecular Biology, National Institute of Malariology, Parasitology and Entomology, Hanoi, Vietnam. KTT planned the study, conducted the field sampling of An. aff. takasagoensis in 2008 and molecular analyses, and drafted the manuscript. NTHN planned the study, conducted molecular analyses, and critically reviewed the manuscript. NTHB planned the study and critically reviewed the manuscript. TS directed the field sampling of An. aff. takasagoensis in 2008 through his expertise in the collection of larvae of the Dirus complex. He also conducted a preliminary investigation of the sampling field using GIS and critically reviewed the manuscript. MY contributed his expertise in molecular analyses and critically reviewed the manuscript. NDM planned the study; contributed his expertise in malaria vector control in Vietnam; collected, identified, and selected the samples; and critically reviewed the manuscript. MT planned the study, contributed his expertise in malaria vector control in Southeast Asia, and critically reviewed the manuscript. All authors read and approved the final manuscript.